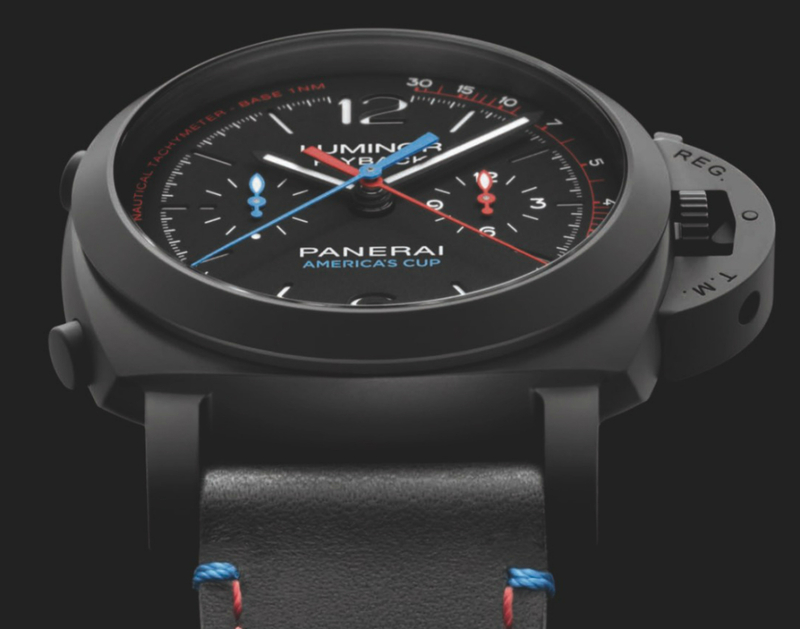 For those in need of a timepiece that can actually serve to time and calculate the race at this year’s America’s Cup, Officine Panerai has two more options up their sleeves for this latest special edition model line. 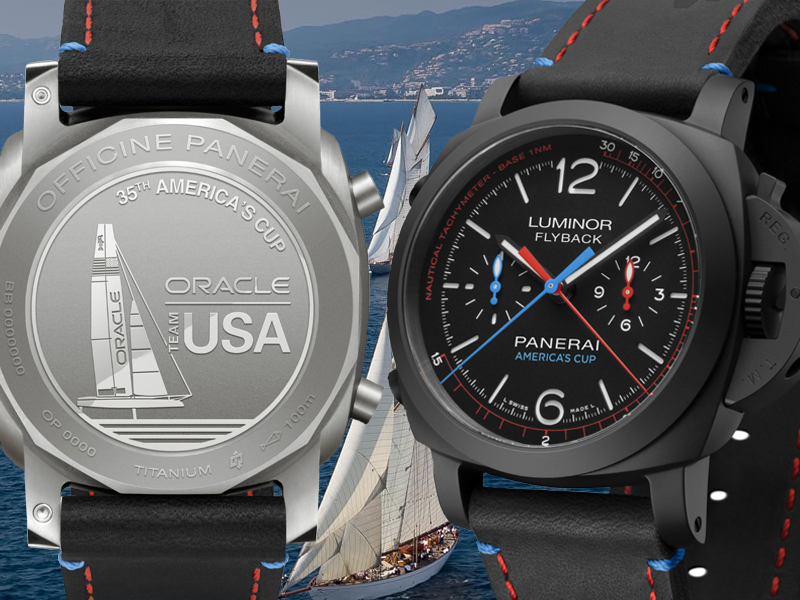 Let’s turn our focus to the watches they’ve developed for their official partner, the returning champions ‘Oracle Team USA’. These boats can reach up to speeds of 90km an hour, as they seek out the perfect current and rush of wind. Originally an adventure turned competition on the southern coast of England, way back in 1851, before being shifting its spectacle to America. 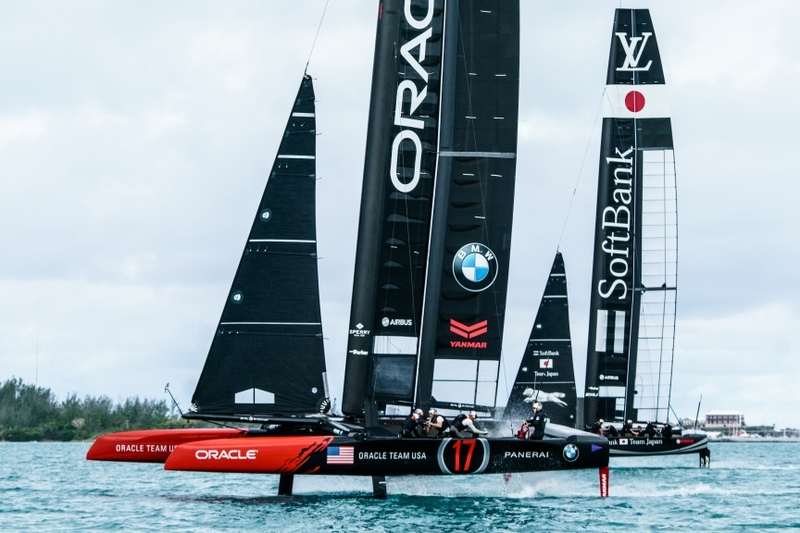 This year the ‘America’s Cup’ is presented by Louis Vuitton and will be held in Bermuda beginning on the 17th of June, 2017. 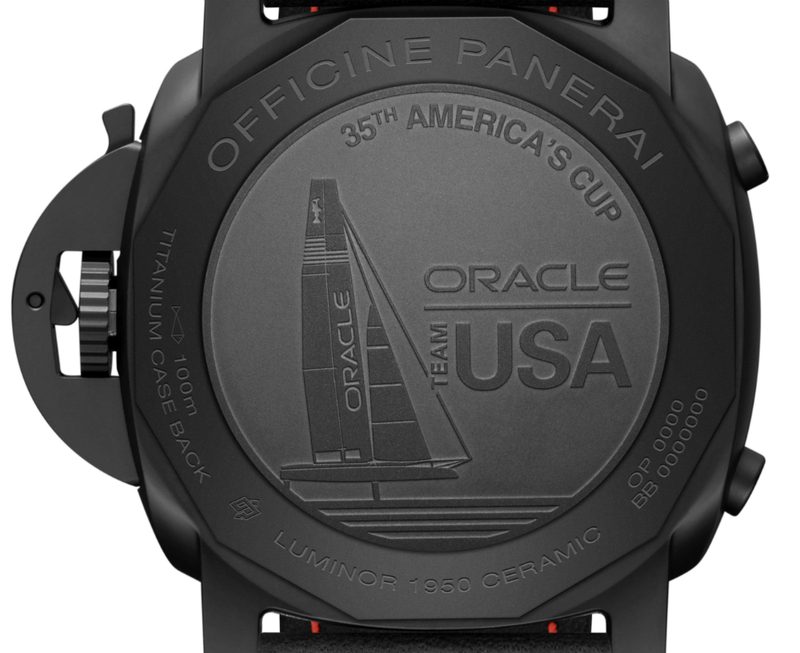 The first Oracle watch we observe here comes in a 44mm case made of black ceramic with a solid case back featuring an engraving of ‘Oracle Team USA’. 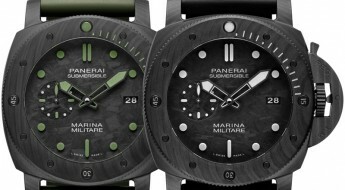 Features two push-pieces on its left-side to operate the chronograph and flyback functions and the iconic Panerai crown guard. 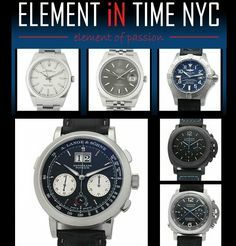 Covered by a sapphire crystal formed of corundum. 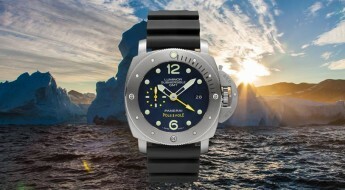 Water-resistance on this timepiece can reach up to 100 meters (330 feet). 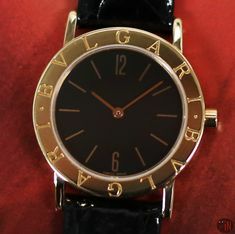 Time is exhibited on a black sandwich dial with white hour index markers and the Arabic numerals 6, 9 and 12. 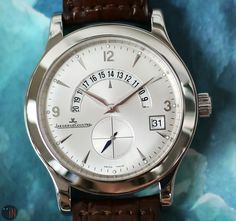 It includes a: 12-hour counter at the 3 o’clock position with a red hand; and a sub-seconds at the 9 o’clock position with a blue hand. 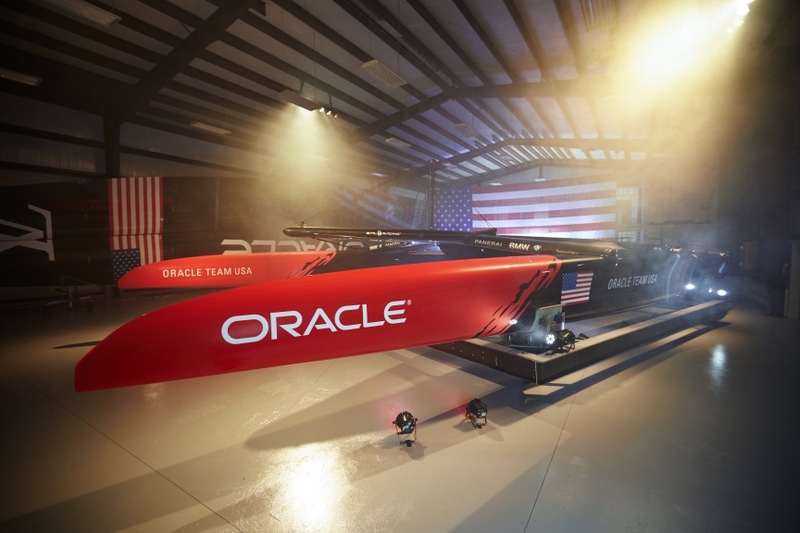 This color scheme is a clear homage to the American heritage this competition celebrates. 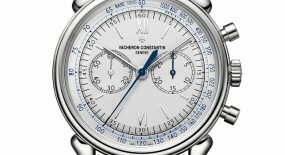 Also circling around the dial is a white minute railroad track; and further out near the bezel is a red nautical tachymeter scale with white Arabic numerals. 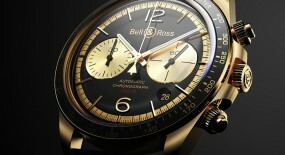 Hands, index markers and numerals have all received a luminescent coating, for an enhanced legibility. 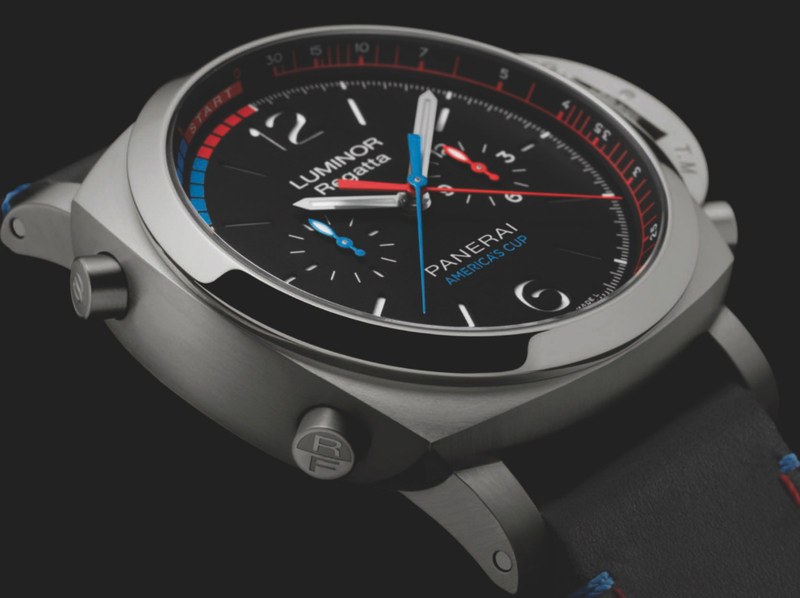 A close look at the central hands reveal two instead of one; they are distinguished from each other by the minute hand being red, while the chronograph seconds hand is colored blue. 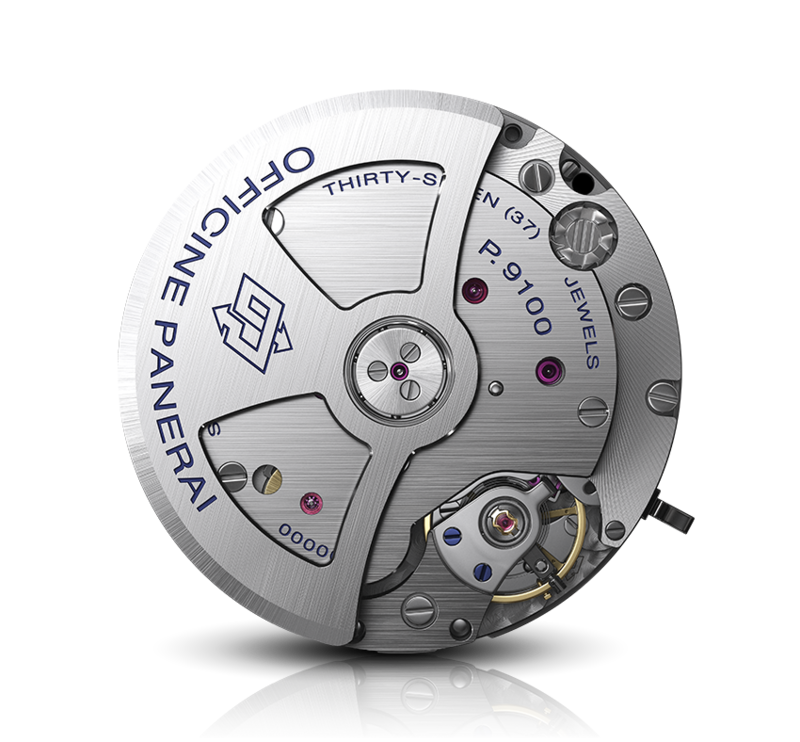 This “Officine Panerai Luminor 1950 Oracle Team USA 3 Days Chrono Flyback” (Ref#: PAM 725) is powered by a self-winding mechanical movement, caliber.9100 with 37 jewels, 302 components and 28,800 vph. 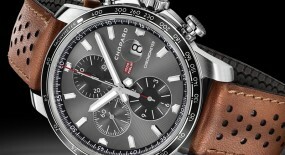 Power reserve on this watch can last up to 72 hours (3 Days), when fully wound. 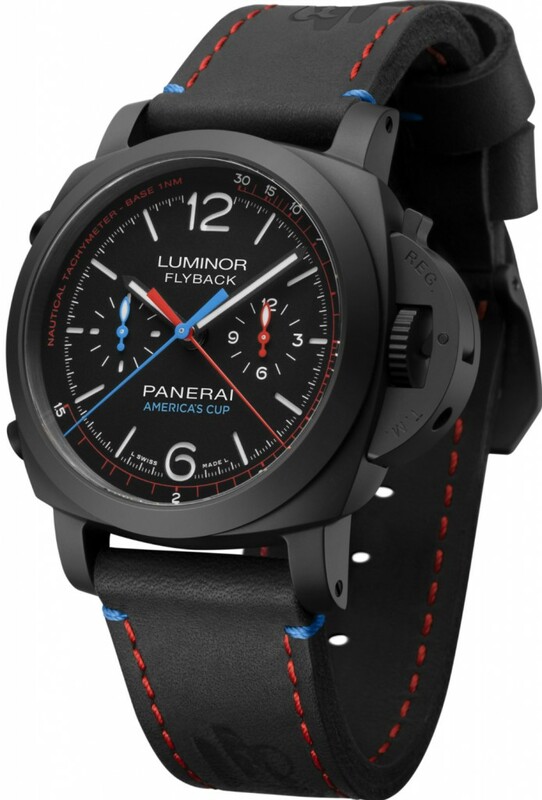 Mounted to the watch is a natural untreated black leather embossed strap with the logo of the ‘America’s Cup’ and exposed blue and red stitching, secured to the wrist by a black ceramic pin buckle. 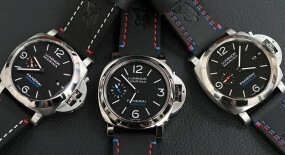 This will be a special limited edition watch of only 200 manufactured pieces. 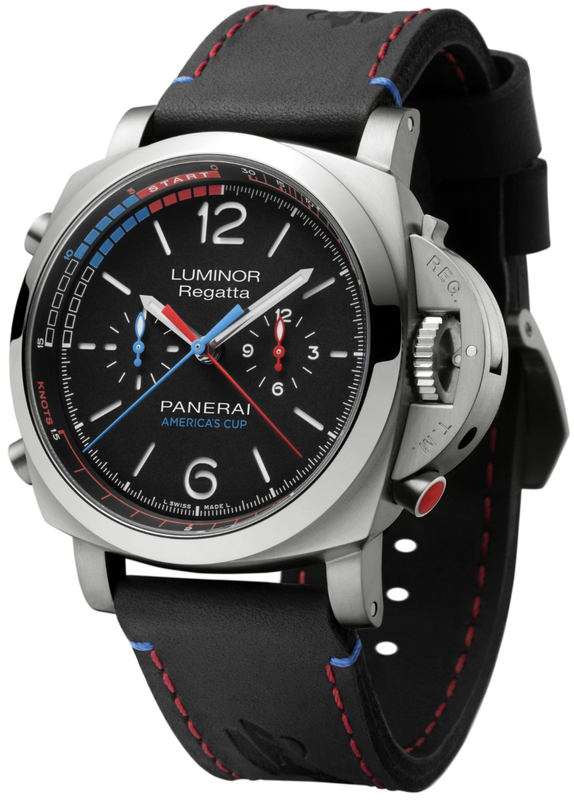 Next up we have the shinier “Luminor 1950 Regatta Oracle Team USA 3 Days Chrono Flyback” with a 47mm case made of titanium with a brushed finish and a solid case back featuring an engraving of ‘Oracle Team USA’. 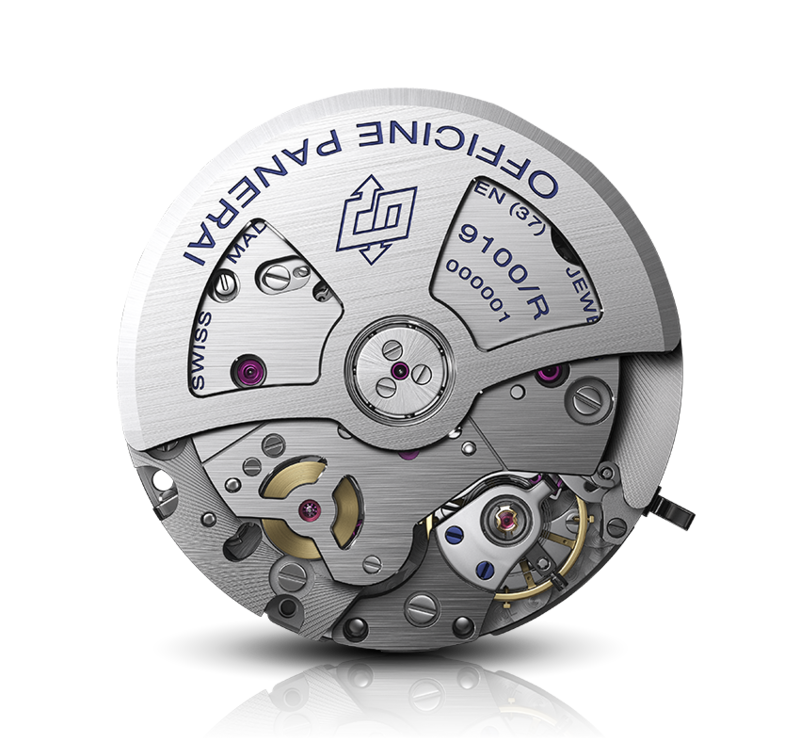 Also features two push-pieces on its left-side to operate the chronograph and flyback functions and the iconic Panerai crown guard. But, there is another push-piece to activate the regatta timer. 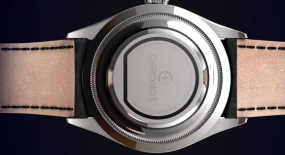 The countdown mechanism can be activated via the pusher at the 4 o’clock position. 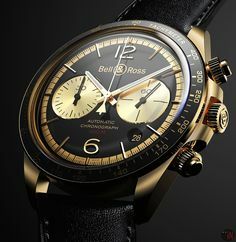 By pressing it the central chronograph minute hand begins to move back in one minute jumps, allowing to readjust to a desired countdown position. 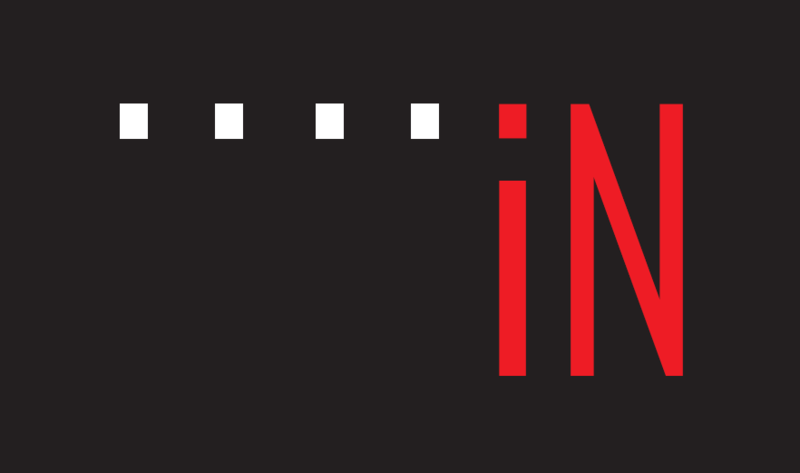 Water-resistance can reach up to 100 meters (330 feet). 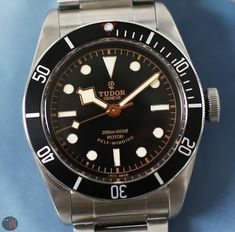 Time is exhibited on a black sandwich dial with white hour index markers and the Arabic numerals 6 and 12. 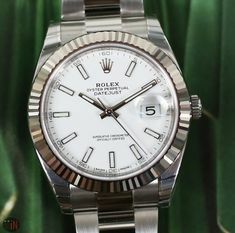 It includes a: 12-hour counter at the 3 o’clock position with a red hand; and a sub-seconds at the 9 o’clock position with a blue hand. 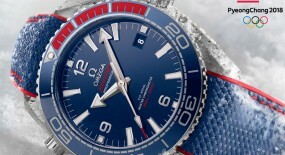 Maintaining the same color scheme as the other ‘Oracle USA’ timepieces with a USA motif. 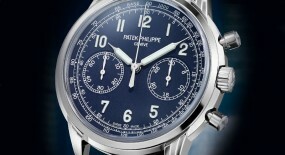 There are two central chronograph hands: a red one for minuets hand and a blue one for the seconds. 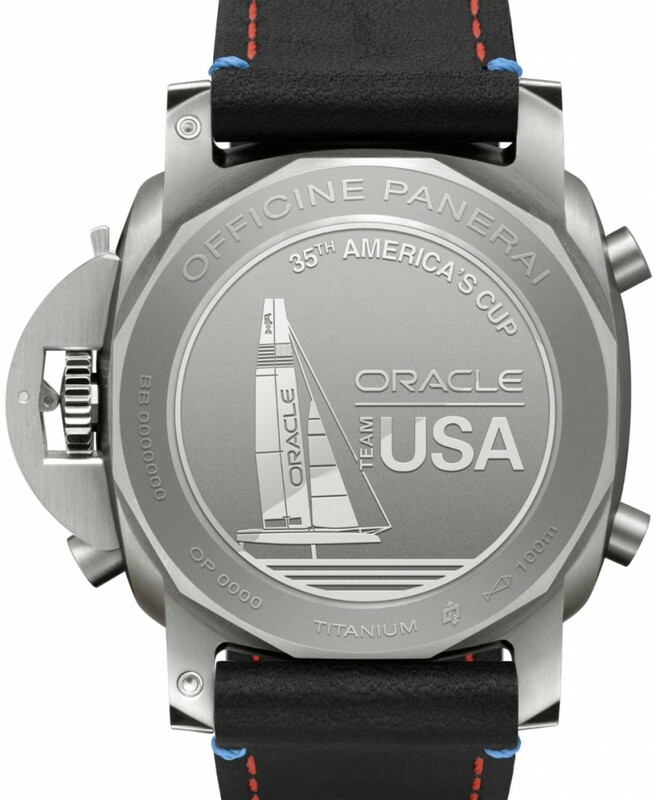 This “Officine Panerai Luminor 1950 Regatta Oracle Team USA 3 Days” (Ref#: PAM 726) is powered by a self-winding mechanical movement, caliber P.9100/R with 37 jewels, 328 components and 28,800 Vph. 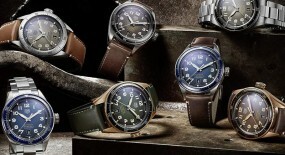 Power reserve on this timepiece can last up to 72 hours (3 days), when fully wound. 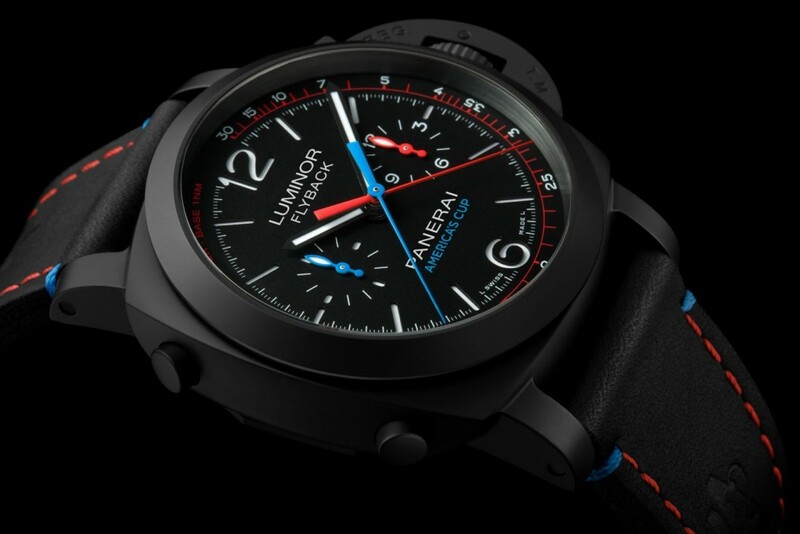 Mounted to the watch is a natural untreated black leather embossed strap with the logo of the ‘America’s Cup’ and exposed blue and red stitching, secured to the wrist by a titanium pin buckle. 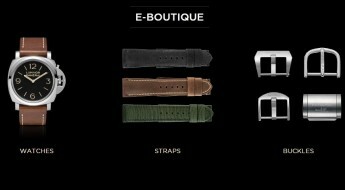 This will be a special limited edition piece of only 200 manufactured pieces.